Every man in the area of Westland, Garden City, Canton or Livonia or for that matter, anywhere in southeast Michigan wants a great haircut. We would like to introduce you to the areas best place for haircuts for men to get that great haircut they’ve been seeking but haven’t been able to attain. We talking about Hair Mechanix of Westland, Michigan. Come in to get a great haircut at a price that is probably less expensive than what you barber charges you. Come in and see us to get a great haircut. A great haircut for men at a lower cost? Also, can that be possible? Yes, it can when you get your haircut by one of our professional stylists. Come in and enjoy an atmosphere far different than your typical barber shop. Here we are decorated with you in mind. This is a place for men where the seating is comfortable and there a big screen tvs throughout tuned into the latest sports, racing and more. Sit back and relax in a comfortable chair and enjoy a beverage while you wait for your favorite stylist. This is the atmosphere you would create at home if only you could get away with doing it. 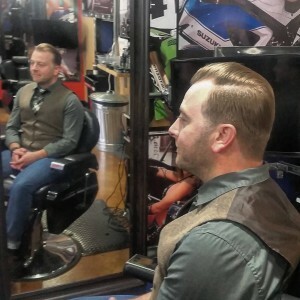 Did we mention that our stylists for men are a little different than your typical barber? Our men’s hair stylists are easy on your eyes. In fact, you might actually find it difficult to take your eyes off of our stylists. When men go to get a haircut at the local barber, they are generally eager to get in and to get out. Get into the barber chair and let him do what he does, then get out of there. Come and get your haircut here. and once you get into the chair and begin conversing with your favorite hair stylist for men, you will want her to take her time. You will not be in any hurry to get in and get out of Hair Mechanix. If you want a great haircut in an extremely relaxing and fun atmosphere with lots of eye candy, be sure that instead of heading to the local barber shop, you head to us for a great haircut for men from an expert hair stylist. Finally, Hair Mechanix is the newest entry into the world of helping men look great with a great haircut at a very reasonable price. Stop in and see us today or the next time you’re ready for a haircut that is a huge cut above what your barber shop delivers.